I am going into battle armed with a one-manual ‘nightmare box’ and squashed onto an organ bench next to a pile of hymn-books to my left, and my copy of the music on my right, due to a music desk that fails miserably with its sole function of being a desk for holding music. The chorus now all rise, like a court jury, to tackle “For unto us”, the four enormous ‘Spice’ basses behind me also rise, not as confidently, but more like the accused, to accept their fate – having not attended as many rehearsals as they really should have! I strike up optimistically with the six-bar intro and off go the twenty-or-so sopranos, “Four Runto ussa child is born..”, answerered rather feebly by the tenors, (both of them). When they get to the ‘born…………’ runs, the ladies show how it ought to be done. It is a demonstration of a confidence and agility of which they can be justifiably proud. After all, they’ve been to ALL the rehearsals and they know their stuff. But this only serves to scare the basses, who soon realise it’s their turn for public exposure, and off they go on a muddled mixture of muffled and approximate wandering groans. A collective uncertainty spreads through the choir and their tuneful notes gradually peter out to a puzzled silence, until we all gird up our loins at full throttle for “Won-der-ful…… Coun-se-llor”. I too get rather excited at this moment, and reach out for the 4′ Principal and give it a confident tug. This particular stop-knob has never been treated like this for years, and completely breaks off in my hand, leaving me in a slight one-handed pickle. A quick assessment of my situation (“I’ve practiced hard for this – but I’ve already upset Deirdre and Enid, the churchwarden thinks I’m a gangster and nearly called the police, we have another 250 pages to go and I have just broken their organ, …”), and decide that there is no escape, and I shall have to use the remaining stalk in my hand to bodge the 4′ Principal back in every time the music goes quiet. This is not going well.. The ‘Pifa’ (Pastoral Symphony), thankfully allows me some brief respite, as my feet get to rest for a while with a few long notes – thank you, Mr Handel. But then, up gets Verity Trilling (Soprano), for her BIG moment. She has brought with her an enormous support team of relatives and university friends, taking up the front five rows of pews. As she rises, so too does a plethora of various iPhones, iPads and cameras, and her grandfather with an old-fashioned enormous cine camera, all of them ready to film her special moment. Her singing teacher has already lectured me intensely on the exact metronome marking for her optimum performance, where to let her breathe, and also the notes to play loudly for her. She now sits on the front row animatedly conducting, breathing every breath and singing every note with her protégé. The next selection of choruses, recitatives and arias are somewhat of a blur, as I reconsider my options regarding the burning smell. ‘Could I possibly go home during the interval?’,’Where is the fire extinguisher?’,’ Do I really need the expenses cheque?’. The CONTRALTO performs ‘He was despised’ suitably laconically, and we all share her pain. Then she treats us to a much more exciting bit, which sounds from where I am rather like “He gave his bag to the spiders”. After many more choruses and solos, we arrive at “Why do the nations” by Ted Drags (Bass). I’ve spent weeks at the gym in training for this and confidently set about the semiquaver pedal bit, (it’s just like running on the spot on a treadmill). The bottom ‘C’ on the pedals has no desire to respond to my weeks of training. Instead, it decides to rest and stubbornly hold onto its note – rather like a drone on a bagpipe, throughout the entire piece. Ted casts many desperate and threatening glares across to me as he launches into “so furiously rage together”. (I resolve to avoid Ted during the interval, to prevent my fingers getting broken). The churchwarden/bouncer unexpectedly becomes my saviour, and with no pretence of ceremony, strides over to the organ and yanks the offending pipe out of its hole and the drone stops. The heart-throb tenor rises to do some ‘breaking’ and ‘dashing’ , but is joined in an unrehearsed and unscheduled duet by one of the over-enthusiastic chorus tenors, who confidently launches into “Let us break their bonds”, before realising that it had been cut. During this, twelve of the sopranos disappear to the back of the church, to supervise the urn and collectively peel back the cling-film from the five plates of rich tea biscuits in time for the interval. The ‘Hallelujah Chorus’ has the congregation rising to its feet in a welcome tradition, probably borne about by the need to allow a supply of blood to the hinder parts of His Majesty King George II, way back in 1743. Part the third – to be continued…! This entry was posted in Uncategorized by St Marys' Organist. Bookmark the permalink. Speaking of “moments” I once watched the sanctus blown off the rack underneath the pedal board while I was playing it! That afternoon purchased tape and “grabber” which is a 3 foot long flexible wire that retrieves the seemingly unretrievable. Grabs errant pencils, service bulletins, cough drops, paper clips and funeral checks! Ace Hardware. This is so good, you really should write a book. I have been a choral and soloist soprano in this work so many times, I can assure you that many singers have had the ‘willies’ about this magnificent work. I pray I have never upset any of the continuo players I have worked with, but can understand your problems with some choral societies, each one a jewel…! In tears from start to finish of this article, so funny, and correct!!. For goodness sake sit down and spend some time with pen and ink and write a book, it would be hilarious. Some “Super Glue” should be an extra in and Organist’s music case. Glad I’m retired after almost 40 years on the “Bench” (Organ). That brought back some happy memories as I giggled my way through it. 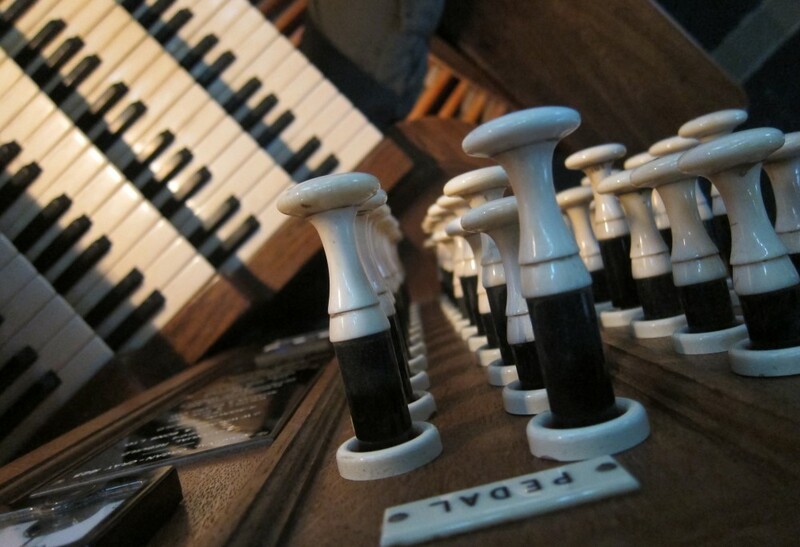 Not long after I’d started playing, I played an organ at a church where my mother’s cousin usually played. I had the same experience when I confidently pulled out a stop only for it to come off in my hand. What made it worse, was that there had been a family feud, and said cousin had only just started speaking to my mother again! My father thankfully (whose mother had been an organist) grabbed the offending stop and stuffed it back in. It was then I realised what characters organs have, and as for choirs….. Yes, HUGE fun! Reminds one of similar experiences, though not, thankfully Messiah. Having said that, our Church choir, some years ago, offered part 1 .I was alto soloist, and found an INSUPERABLE barrier, in that the organist couldn’t see the conductor, I couldn’t see the organist, the tenor and soprano both SCREAMED their airs and I had to sing ‘But who may abide’, which was new to me, as it’s usually sung by bass, although actually written for alto. But the congregation loved it, especially when I nimbly skipped up the scale in ‘O thou that tellest’, ending up an octave higher than it is usually sung. Choirmaster sulked when I got the plaudits (well his wife was Shrieking Sop) and a good time was had by (nearly) all. Keep up the good work! This is HUGELY entertaining! Long may your Chronicles continue – most enjoyable and a hoot. How will I ever be able to look at the Messiah again, without having an attack of FF giggles. Wonderful, Brilliant! Ah but Rich Tea Biscuits. Methodist Biscuits I call them, The Old Ladies weekly Fix. I seen many an elderly bewhiskered lady with whiskered en crumbed faces leering over a cup of tea. I am neither Methodist or elderly female, but I adore Rich Tea! They are the right consistency for dunking, and low in sugar for my diet.